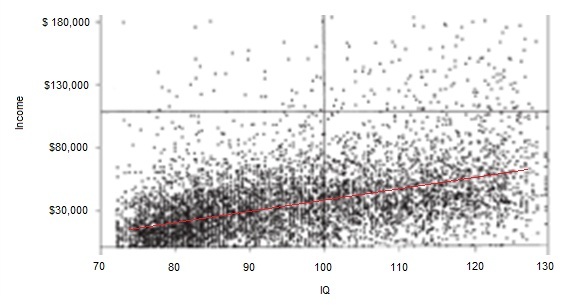 It boils down to IQ, in that less intelligent people typically earn less. Second, the increasingly competitive economy has made IQ more important, magnifying the socioeconomic ramifications of individual cognitive differences. Intelligence tests indirectly measure situational awareness, learning speed, and ability to make inferences between disparate, abstract events and data – skills that are necessary in an increasingly competitive and technological economy, and those who are less intelligent, even if they have a high school diploma, may still be at a major disadvantage since those skills cannot be readily taught in a classroom. Smarter people learn faster because they retain more of what they read and observe, resulting in fewer repetitions to mastery. Although you can create heuristics and shortcuts, you cannot reliably make a person with a low IQ juggle as many ideas simultaneously in his head as someone with a higher IQ. Generations ago, low-IQ people simply did not graduate high school, but now many do because of grade inflation and remedial classes. Not surprisingly, when these dullards get into the real world they fail without the special accommodations and coddling they had earlier in life, especially in today’s hyper-competitive economy. If you took these dullards and transported them back to 1900 they would do better, relatively speaking. Maybe they would earn 70-100% of what was then the mean per capita income in 1900 instead of 50% or so of the mean per capita income in 2015.